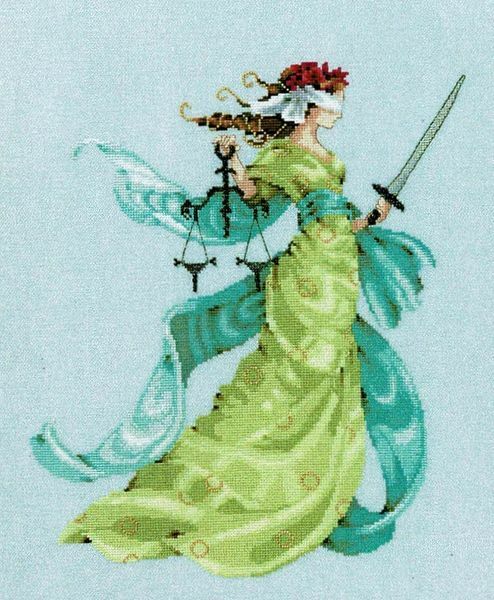 The rose crowned Lady Justice swiftly cuts to the core of truth Designer Nora Corbett. 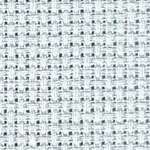 The leaflet has a black and white chart printed 10 stitches to 1.5 centimetres on an A2 sheet with key and instructions. 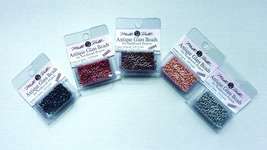 The pattern is worked in whole cross stitch, quarter cross stitch and backstitch using 34 shades of stranded cottons in 36 skeins, two blended shades and Kreinik #4 braid in 018 navy and 001HL high lustre silver. 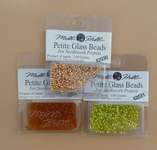 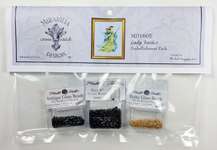 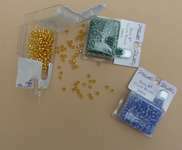 There are added Mill Hill beads - antique seed 03002 midnight, petite seed 42011 victorian gold, size 8 18002 midnight which may be found as an Embellishment Pack in our Supplies and Accessories Section. 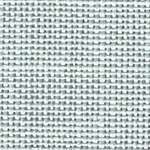 The stitch count is 170 by 202 and the model was stitched on 32 count Graceful Grey linen CL065L/320, with 16 count Graceful Grey CC355L/320 as an alternative, using DMC floss.